The Federal Government is to create seven more rail corridors of standard gauge railways in the country, the Minister of Transportation, Mr Chibuike Rotimi Amaechi, has said. Amaechi made the plan known in Port Harcourt at the inauguration of Port Harcourt – Aba Mass Transit Train Services. He said the initiative was a public-private-partnership which sought to modernise and expand railway transportation across the country. “This initiative is aimed at remodelling and redevelopment of our major railway stations within the country. “Under the rail modernisation programme, government will open new railway lines to achieve an efficient rail network. “The Ministry of Transportation has carried out feasibility studies to create seven additional rail corridors of standard gauge railways under the public-private-partnership initiative,” he said. 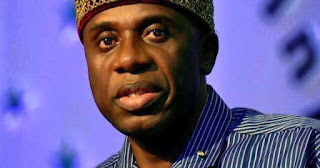 Amaechi said that government would soon sponsor five bills for passage into law by the National Assembly to enable effective private sector participation in the transport sector. The minister said that the bills included the Nigerian Railway Authority Bill; National Transport Commission Bill, National Port and Harbour Authority Bill and the National Inland Waterways Authority Bill.